What have you guys been doing since Super Nature premiered? Identifying missing cables, buying thank-you gifts that don’t arrive at their destinations, booking plane tickets for New York, wondering if all of our cast is coming, which we’ve finally confirmed, one month before we’re all due in New York. Anything else? Trying to get some sunshine. Teaching in Ohio. Re-adjusting to not having babysitting five to seven hours per day. This is actually great, because I want us to get this out of our systems—the logistics and the career and the fundraising and the tickets. Let’s not talk about that stuff. Great! I love it. Yes. And maybe to get it out of my system, I’ll say where I am. I flew out of Las Vegas today, and I feel like I’m kind of tripping. But I was thinking about where I’m at right now and how it can help us talk, because I loved Las Vegas, just the sensory deliciousness, the lights, the scale, the visual, so as I was transitioning out of that I was thinking about your show, and how you dealt with scale and space and sensory deliciousness. So there’s half—and just before Las Vegas I was at Figure Space [at Earthdance] with Steve Paxton and Lisa Nelson, and that felt—well, one thing we were really working with was undifferentiated space. Which for them, I think, was space on an architectural scale, and space inside the body on a microscopic scale, and working in a place where you lose track of which space you’re in. I think of that as BodyCartography territory, too, so I’m not surprised to see you’re nodding to what Steve and Lisa were talking about. I’m interested in surface—just what the audience saw—and how you dealt with the [Walker Art Center’s] McGuire Theater, those ideas of space, in the actual making of the piece. Just grab whatever part of that you want to talk about. I think, with this piece, we always knew where it was going to be: at the McGuire Theater. For those who haven’t been there it’s a black box theater that’s 60-feet deep by 60-feet wide. It’s pretty big and the seats go right down to the floor – the first row of seats is right on the stage – which I always like. It’s a very high fly space, a very high ceiling in the theater, higher than your average contemporary dance venue. The visual artist we were working with, doing sets and costumes, originally wanted to put a drop ceiling in the theater, but we decided that would be just too much material to contend with when we were going to tour. We’ve already done a lot of shows with set elements, and we thought it seemed really excessive. Then we went on a residency on a farm —Lilysprings Farm [in Wisconsin]—and there was a really beautiful washing line. Olive had an idea to crash the washing line with the drop ceiling idea so that when people came in there would be a rope attached to the top proscenium arch and going back into a vanishing point on the upstage right side of the space. We wanted to change the scale of the space, to create a sense of dynamic change or shifting power. Yes – between the bodies and the space itself. So, if you were in the space underneath the line, the rope came to about five-and-a-half feet at the back wall; it functioned like a little room. Someone in the talkback said it annihilated the black box feel of the stage, to have the vanishing point just disappearing behind the wall. That’s pretty evident in the first half of the piece: it’s just black, and you have this vanishing point, and the first section—or the first beginning—has a lot of interruptions, a crash between the social and the physiological. In the second half of the piece a mobile forest comes in, and there’s fog, and, at least to me, the space changes a lot because of the trees and fog and different lighting. In the beginning [the activity feels more social], you have a sense of cause and effect, of one thing happening at a time. You can see that all change once the fog and the trees come in: the line of sight really spreads horizontally, and many different things are happening at the same time. And to speak to this kind of undifferentiated space, we shift from a space we know to a space that we experience unconsciously, that we only know on a cellular level – on the level that’s more about biology or intuition or landscapes or things that are happening in the dark. There’s something about that horizontal space that makes it no longer about these people, or this social space. It’s bringing in many other beings, creatures, landforms, and going micro, inside ourselves at the same time. It took a long time to figure out what the geography of the second half of Super Nature would be. It had to arrive organically, but we still had to get it there before there was a premiere [laughs]. So, that meant speeding up either the geography or the biology somehow in order to figure out what the structure of that second half of the work would be. Are you talking about the hurry to get it there in terms of what the performers had to traverse to be ready to be in that state at that moment? They have to get to a point where they’re in that state, but we also have to come to an agreement ahead of time. It’s really hard for performers to make good improvisational choices around timing and space because of the sensory deprivation involved in most of the second half of the work – they’re not able to perceive everything going on around them. Some are stuck inside the mass of others’ bodies; or, somebody else’s full weight is on them, and they can’t move quickly. Some of the performers literally can’t see: they’re under a blanket, or they’re in the fog [laughs]. Some are under a tree. There’s something limiting their ability to perceive the space around them. So, the work’s structure did eventually form itself, but it was a long time coming. I want to back up a little bit. In our history of making site-based work, it’s been hard for us not to go into the theater and use that theater as the site – that is, we’re always tempted to really play with everything that’s in the space itself. But Super Nature started with an installation piece in the gallery, with research: it began in this incredibly intimate space with one audience member at a time. After that, we needed to go into the McGuire, so the question was: How can we translate that intimacy, that level of move-or-be-moved-by-whomever-else-is-in-the-room immediacy? How can we bring it into the theater? How can we super-actively work this space to affect and be affected, as performers, and also to affect our audiences? To allow ourselves to be seen on every side of our body, but also to really create transformation in how people are watching us? Those were the questions that informed many of the structural and choreographic choices of the work, too. Do you think there was something to learn from the McGuire Theater? There’s something indulgent in it. It’s so lovely to work in that space, to have that kind of fly space and wing space, but also to have such intimacy, to have the benefit of that compressed space with the audience. I feel like it will be hard to put this work in different spaces and see how the work changes, because Super Nature was so constructed with the McGuire in mind. What I mentioned about the first row of seats going all the way onto the stage—you don’t find that at all theaters. And in the McGuire, we were really able to use that intimacy: there are two aisles and we could move people between the house and the stage easily. We found that kind of zoom-in to be really helpful in achieving what Olive was talking about. Knowing that there are people all around you—it knocks out a degree of passivity. I didn’t see the piece, so I don’t know its effect on the audience first-hand. But I imagine, and I heard from people who did watch from the audience, that the first sections of the work, in particular, disrupted their expectations. You’re watching the stage and then something is happening in the house where the audience is, and now it’s just on the stage again, but then someone new comes in among the audience. There’s a lot of interruption – of space and of activity – and we learned the ways that we wanted to do that from the context of the McGuire. Zeena [Parkins] didn’t compose the score to relate to the space, but she did spatialize the score specifically for the McGuire, in terms of speaker placement. The whole score emerged from behind the audience, or at the proscenium arch, or on the speakers on the stage; she also had a speaker set up in the pass-through, in the back hallway, and she had people doing live Foley up in the balconies. So, she was using different sounds and different speaker placements to try to do much the same thing we were doing in our play with proximity and affect. I also learned what fog does in that space when you have an audience, and where the fog goes: It leaves the theater really quickly when you have an audience. So, that was another thing, on a really practical level, that I learned about that particular venue [laughs]. You’ve worked with this composer before. Did you learn anything from working with Zeena again here? Interesting question. I feel like this was a more fully articulated development of ideas from Half-Life and also Mammal, our previous collaborations with her. So, in some ways the ideas in play weren’t new to me, but Super Nature represented a fuller manifestation of those ideas. I ask because you’re talking about working with space, and with undifferentiated space, and she’s sending sounds from different parts of the performance area, really helping to shape that space. And what’s interesting is that there was this huge difference between the audience space and the dancing space in terms of how the sounds were perceived. Right – I mean, how you can perceive all that when you’re focused on doing your work, when you’re dancing. That’s where your focus is. Yeah. Some sections of the show, I could really feel what was happening; but other times, it took a while for me to really hear what she was doing. All the sound stuff got finished near the end – Zeena is in New York and we’re in Minneapolis, so it wasn’t like she was playing along with the rehearsals. The real compositional choice-making was in deciding to work with Zeena again, it sounds like. Because we [HIJACK] so often use found sound, it’s striking to me how different that must be—it’s like a big saying yes and then working out the deadline. I’m sure however rich the negotiation is about little details at the end, it’s just something you said a big “Yes!” to — you’re excited to see what her sound contribution is going to be. Well, Zeena did come here twice before the premiere. We also had sound Zeena recorded that Olive was able to play during rehearsal and at showings. But it was interesting feedback. I’ve never heard that feedback before. That’s an interesting, different perception of the interplay of the dance and the score. “What do you want music to do?” would have been my question back to that commenter, but I wasn’t in the conversation. What you’re saying also brings up the importance of casting. Casting is a choreographic choice. Casting is the biggest thing. For us, in our work. Then you better love ‘em! Better love ‘em. What you brought up with the sound, Kristin: the idea that, if you’re not controlling the music, you want to trust the person that is. We used the breathing. But there’s this collection of sounds from us that she’ll use again somewhere, or that might come back again in another piece we make together. And that sort of history of collecting is interesting, too. I’d love to jump on the idea of continuity with your past work. I really want to ask you about Super Nature, and how successful you thought it was. It feels especially timely, like it’s a contemporary statement from you and about the culture at large. We’re poorly equipped to assess what we’re making now, but continuing to make new work is a way of getting some distance on what you’ve made in the past; it means being able to have a really strong opinion about one’s own past work. Can we talk about some of your earlier work – say, Half Life or Symptom? Having made Super Nature, what do you now know about those pieces that you didn’t before? I can speak back to Holiday House now [laughter]. I can also say that Mammal was totally the idea of taking all these great moments in our work, because we didn’t have enough time with the Lyon Opera Ballet. We had 18 days there – we didn’t have enough time to invent a whole new thing, to get to know those dancers and develop a whole new piece with them. The process of making Mammal was more like: How can we pull in what we know and what we know we can teach, what we know will work and is exciting? So, we took a whole bunch of stuff from Holiday House—scores, not choreography—and then reframed it. Really, that was the seed – those new things that started happening out of that piece – that birthed Super Nature, in a way. That’s one tangent. And then it feels like Half Life was a whole other one – like it speaks to Super Nature in the sense that both works are responding to the environment in some way, but they’re talking about it in completely different languages. Half Life was really dark – bogged down by research and bogged down by trying to figure out how to simply bring it to fruition: how to get a visa and how to get the dancer we wanted. It was a real struggle for that work to be made manifest. Super Nature has a kind of magic, a kind of levity around it. This work easily manifested what it needed. Right, a new work is the antidote, somehow, for the last experience. Symptom is the piece we made before Super Nature; it was this really cerebral work, so we knew the next piece would be super physical. The extra space for shaping the final product, because not as much energy is invested in inventing the process – right. There’s such a high value on novelty in contemporary dance—or whatever you want to call this field we’re in, so much pressure to create something new, always to do something different. To reinvent your whole process. But no one’s trying to say that to Robert Wilson! Why is there such high value put on the new? Why not redo what you’ve done before and see what other things come out of it? For instance, I was trying to direct this thing we’d been doing, this one-on-one score responding to the changing space between two people; the performers weren’t really getting it, so we just did the piece as a group of people instead. And that new interpretation was the basis for a lot in Super Nature. I’m interested in the translation from score into movement, the manifestation of that and, from here, the translation from movement into language, or maybe audio into typed-out words. Could you describe Super Nature’s movement as movement? That is: Could you pick one section and just talk about the dance – not as if from a score, but from the perspective of seeing it? What did the dance look like? How were the performers moving? Like a traveling, evolving individual of multiple species. Olive, you stole what I was going to say [laughter, and a long pause]. There’s a solo in the show that looks like a crash between someone who is enacting recognizable dance vocabulary, but they’re doing it in a social manner; at the same time their breathing pattern seems out of sync with what they’re doing, and then it matches what they’re doing – the breath matching the movement and the movement changing the breath coming out. There’s a solo that turns into a trio of shooting planets, or stars that are imploding or exploding. That was not the intention behind the choregraphy, at all. But it also makes sense that you’re in a different position, being in the piece, seeing the breath score. Of course! You’re still doing this piece. In one section, the movement coalesces in piles of bodies, like complex jigsaws. Or, just piles of bodies where it’s hard to discern whose body parts are whose. I hadn’t recognized that till now. I’ll be sure to put “move 562 and 563 courtesy of BodyCartography” in the program. Didn’t that also happen in Fetish? When you refer to the space-in-between score, it just makes me laugh – as if it’s this albatross, “The Score.” That’s always going to be in every piece – it’s the choreography that you’re making, of course, but it could also be a metaphor for what your collaboration is, how, as BodyCartography, you’re combining two people’s voices. And if we had another half hour—or another three hours—Arwen and I would grill you on your collaboration! Speaking of which: I could describe our partnership, with HIJACK, a little bit. We’ve gone through phases of emphasizing different things, both for others and for ourselves. There’s sometimes been an understanding that HIJACK is a single, united voice; an authorship obscuring the fact that it’s made of two people. But maybe now we’re in a phase where our understanding of the collaboration is more sensitized to how it’s a crashing of two individual authorships, in the choreographic process and onstage, and not necessarily always unified in so doing. With BodyCartography, what are you-all doing? —I was figuring out what the whole thing would be. Otto’s role was bringing in all those initial seeds, and manifesting them from the inside; then I was directing from the outside, figuring out how all those parts needed to speak to other parts of the piece. I also work with details – housekeeping details, like “don’t look to the right, look to the left,” that kind of directing. Do you think you’ll use a setup like this again? Or, do you think you’ll seek an antidote, like a project where Olive is inside and Otto directs from the outside? No. I think this is just what we do. I think it’s what we’ve been doing for a while now, actually, and we’re just getting clearer about articulating that. HIJACK is the Minneapolis-based choreographic collaboration of Kristin Van Loon and Arwen Wilder. Specializing in the inappropriate since 1993, they insert dance where it is least expected. HIJACK is best known for “short-shorts”: pop song-length miniatures designed to deliver a sharp shock and collaborations with po-mo hero Scott Heron. The duo has taught and performed in New York (at DTW, PS122, HERE ArtCenter, Catch Series/Movement Research Festival, Chocolate Factory, La Mama, Dixon Place), Japan, Russia, Ottawa, Chicago, Colorado, New Orleans, Seattle, San Francisco, Fuse Box Festival, and Bates Dance Festival. Commissions include DTW/Tere O’Connor’s “Nothing Festival”, James Sewell Ballet, U of MN, Bedlam Theatre. HIJACK has taught a Wednesday morning “Contact Improvisation” class at Zenon Dance School continuously for 14 years. Van Loon and Wilder are currently at work re-imagining their Walker Art Center-commissioned nonet, redundant, ready, reading, radish, Red Eye into a piece for awkward spaces. As co-directors of the BodyCartography Project Olive Bieringa (NZ) and Otto Ramstad (USA) investigate empathy and the physicality of space in urban, domestic, wild and social landscapes through dance, performance, video, installation work and movement education. Our works range from intimate solos for the street or stage, to large site based community dance works , short experimental films in the wilderness, to complex works for the stage. We have created numerous performance works, short films and installations across the USA, Canada, New Zealand, Japan, Europe, Russia and South America and were recently named Dance Company of the Year by the Twin Cities City Pages. Recent works include Super Nature, with composer Zeena Parkins, commissioned by the Walker Art Center, Performance Space 122 and PADL West. 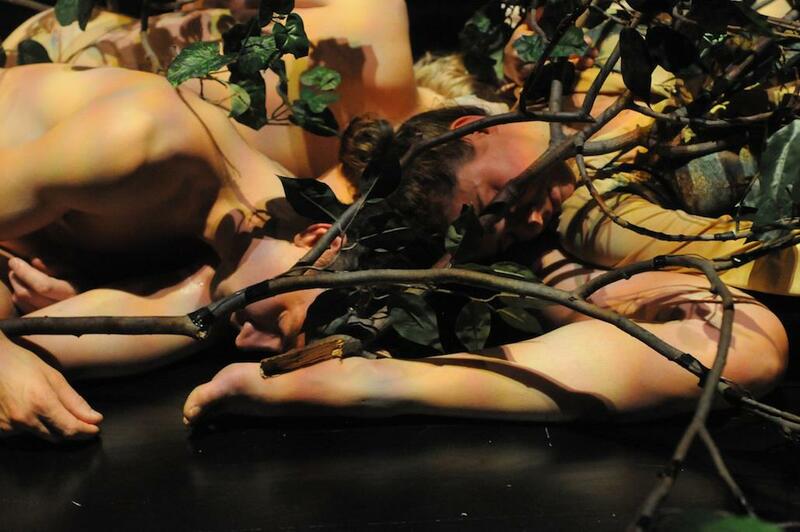 Symptom, with Minnesota twins Emmett and Otto Ramstad and Mammal, a commission for the Lyon Opera Ballet. Our triology Holiday House (2005-2007) was commissioned in part by the Walker Art Center, Minneapolis and was the winner of two Minnesota Sage Awards. Our site spectacle Lagoon was the winner of the Perlorous Trust Creativity Award at the New Zealand Fringe Festival in 2003. We are featured artists in the first book about site dance in the USA published by University of Florida Press entitled Site Dance, the Lure of Alternative Spaces. Note: A version of this interview was originally published on Critical Correspondence and that conversation is reproduced here with permission. The original transcript has been edited for clarity as published here by mnartists.org.